After reading my previous post about the benefits of dome cameras, I bet you can’t wait to discover what would be the reasons for buying and using bullet cameras. Today we shed light on what a bullet CCTV camera is and the unparalleled advantages of bullet security cameras. Bullet security cameras are the video monitoring cameras shaped like rifles or lipstick cases. And that’s why they are also called lipstick cameras. The bullet surveillance cameras are often installed outside to a wall or a ceiling and point at a certain direction like the barrel of guns. IR bullet cameras mean the infrared bullet cameras, which can present crystal clear images in low-lit conditions and even in total darkness with the built-in LED lights, such as the Reolink infrared bullet security camera RLC-410. 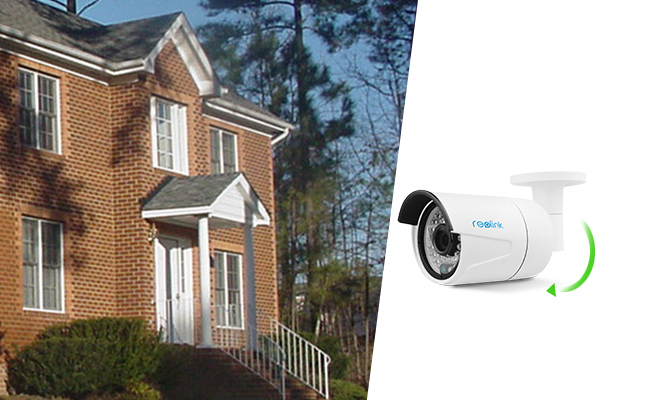 Below we’ve summed up the top 7 advantages of bullet security cameras for your reference. And in case we miss anything more about the reasons to buy bullet CCTV cameras, please feel free to leave your comment below. Bullet cameras are versatile in terms of functionality when comparing with dome surveillance cameras. By the same token, bullet type cameras, technically speaking, could be IP bullet cameras or analog bullet security cameras, and some of them could be packed with IR night vision or other advanced technologies like optical zoom, motion sensors or thermal sensors. Surprisingly and interestingly, the majority of WiFi-enabled surveillance cameras fall into the category of bullet CCTV cameras instead of dome-shaped cameras, of course, a few exceptions aside. Wireless IP bullet cameras are increasingly popular with consumers as camera technologies and security techniques are emerging and evolving fast over the years. Particularly, dual-band wireless bullet security cameras are edging out its counterparts, in which 2T2R (2 transmit and 2 receive paths) MIMO (multiple-input and multiple-output) antennas minimizes errors, ensures top speed, and eliminates the WiFi cut-off or WiFi disruption, problems easily caused by a single antenna. The possible philosophy behind the design lies in the assumption that, to some extent, it pleases our eye, especially dual-band WiFi bullet cameras. Symmetry in appearance and stability in WiFi signal all roll into one. Apart from being WiFi-capable, bullet type cameras can easily be embedded with micro SD card to store motion-triggered videos and snapshots. 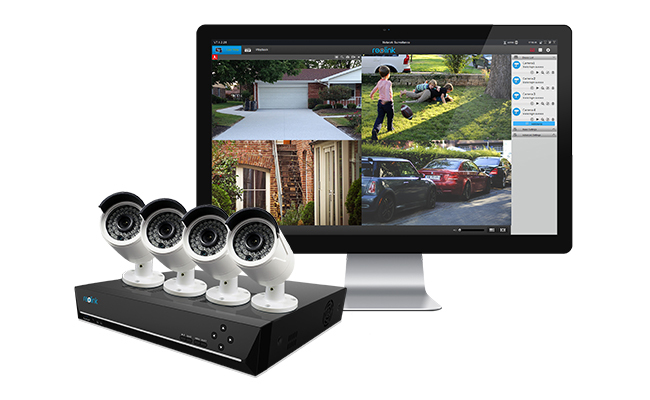 It’s a frequently asked question by home security newbies: where should I place my newly-purchased security cameras? It strikes particular chords with many first buyers and question always arises whether bullet security cameras and dome surveillance cameras make a difference when the placement of cameras comes into play. Yes, of course. In my previous article, we touched on the benefits of dome surveillance cameras, in which we familiarize ourselves with the possible wider coverage and wide field of view of dome security cameras. Dome cameras, ideally, are designed to be ceiling-mounted to reach maximum potentials and achieve optimal surveillance on large areas. 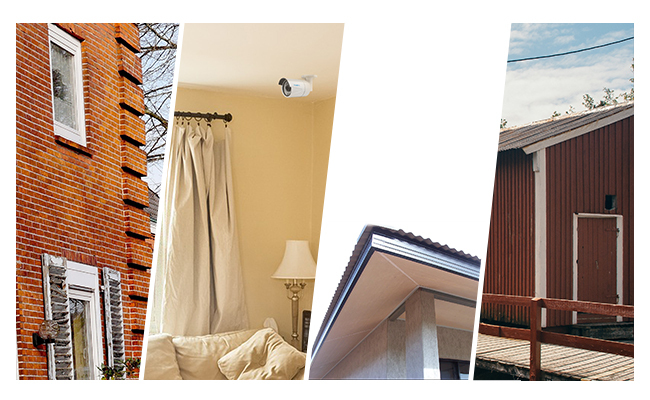 While bullet type surveillance cameras tend to be more flexible in terms of placement, which could be mounted on walls, soffit, the overhang of the roof, or under the eave. 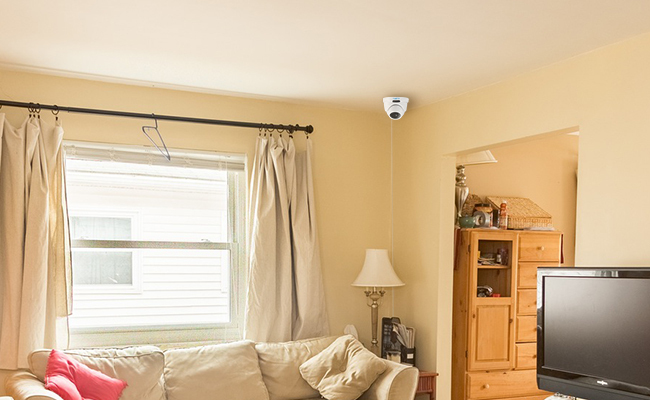 The unique property of bullet style security cameras means they’re cut out for keeping eye on relatively smaller swath of land or “bottleneck” areas such as the driveway, garage, front door, back door, stairway, hallway, entryway, etc. Having said that, it doesn’t mean bullet type security cameras are significantly inferior to dome cameras. 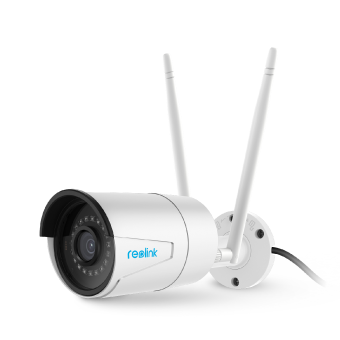 On the contrary, bullet cameras could be equally and exceptionally good in performance, such as the wireless bullet security camera Reolink RLC-410W. Mini bullet security cameras are excelling its counterparts as well when it comes to mounting options, not to mention the maneuverability. Configured as a flexible choice with robotic neck, the unique engineering design of bullet CCTV cameras lays the groundwork for adjusting pointing angle easily, further smoothing away any miscalculation or remodeling after installation. If the viewing angle of a bullet outdoor camera is inappropriately set, you are still able to alter the direction your bullet camera points without grappling with re-drilling or destruction on your beautifully painted foyer or facade. 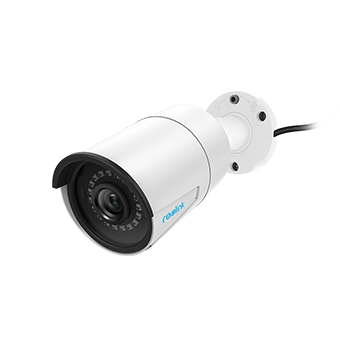 Different from dome cameras, which normally are screwed or fixed firmly and impossible to readjust the angle of view after mounting, bullet security cameras, however, could be immune to such snag. If you are in the market for outdoor surveillance cameras, it’s essential that outdoor cameras can withstand various weather conditions, for example, freezing winter or other inclement weathers such burning hot summer. Since the majority of bullet security cameras are placed outdoor, it’s wise to choose an outdoor bullet camera with IP rating 66 to be waterproof and withstand the impacts liquid like rainwater. Despite not being tamper-proof by its nature, outdoor bullet CCTV cameras can still be protected from vandalism by placing them out of intruders’ reach or encasing them with extra housing. Even though being slightly less discreet or a bit intrusive, outdoor bullet surveillance cameras are still extensively popular with homeowners. Because the visibility of bullet CCTV cameras could positively deter potential break-in in some scenarios. A recent survey into the mindset of convicted burglars reveals some interesting insights on home invasion, a visible surveillance camera, to some extent, could put would-be intruder off. A noticeable and overt bullet camera in residential areas sometimes helps keep your house off the target, which in return would be pretty significant in protecting your property. Of course, there are many other helpful solutions you can take to avoid being burglarized, for example, external lighting, alarm system, door sensor, and door lock. Many private surveillance owners might have stumbled on problems. For example, the images get washed out when outdoor security cameras or indoor security cameras pointing at the reflective surface, for example, a body of water or window. Reflection of light, similar to blinding the surveillance cameras intentionally, will obscure and cause whiteout on videos and images, especially for outdoor dome security cameras, which could be rendered as useless or paralyzed if placing improperly. Generally speaking, bullet home video cameras are less likely to suffer the same fate due to the fact that bullet surveillance cameras largely point downward when placed on a vantage point. Many homeowners are embroiled in zoning disputes or property line conflict with neighbors, or deeply plagued by unauthorized cutting through private property by strangers or passers-by, prompting them to look for security cameras to control damage or avoid legal wrangle. The bullet surveillance cameras, in many occasions, become well-received and sought-after options for surveillance even without an ultra-wide field of view, for it helps keep tabs on these flashpoints. Additionally, it is less likely to invade neighbor’s privacy inadvertently since bullet-shaped cameras cover less but crucial ground around your perimeter. If your bullet security cameras, accidentally point in the wrong direction and consequently infringe on your neighbor’s privacy, you are able to readjust them much easier later on. Especially, voices against privacy breach by neighbor’s CCTV cameras are getting louder. To address growing concern, legal proposal for the home surveillance drone could also be in the pipeline. It’s rumored that bullet cameras are better than dome surveillance cameras in terms of picture quality. The truth is that picture quality is largely determined by inner components such as camera sensor, resolution, lens, etc. But under some circumstance, bullet-shaped video surveillance cameras could deliver non-distorted pictures compared with fisheye cameras. After referring to the CCTV bullet camera reviews and comparing the highlights of different bullet security cameras for sale, here we’ve picked up two best bullet camera for your options. 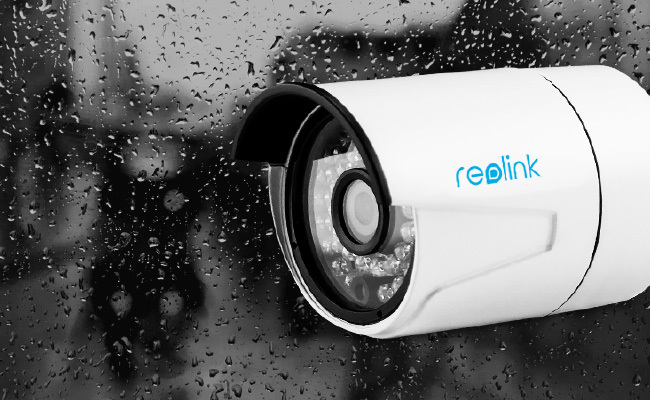 As the best seller among bullet outdoor cameras, Reolink RLC-410 is your ideal security solution that gets the job done without breaking the bank. Below are the bullet CCTV camera reviews from Techhive. Video Transcription: A lazy mailman was captured by the bullet camera Reolink RLC-410 throwing fragile packages from a distance. 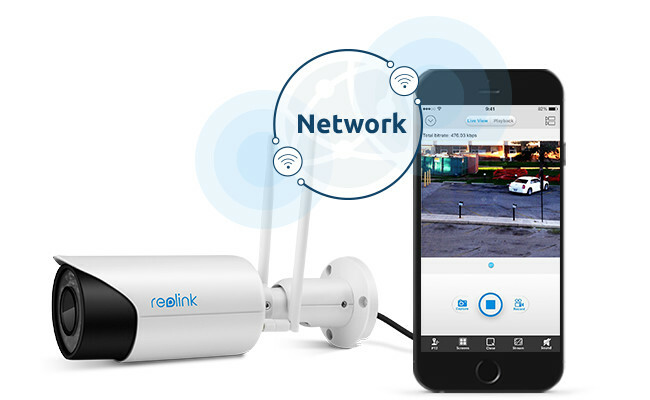 If you need a wireless bullet security camera that can withstand all the harsh weather conditions, Reolink RLC-410W is absolutely an option you won’t regret later. 5MP/4MP Super HD, Outdoor/Indoor Protection, Dual-Band WiFi 2.4 GHz and 5 GHz, Audio Recording, and SD Card Storage. Despite obvious advantages of bullet cameras, there are hard-to-ignored vulnerabilities in bullet security cameras. For example, if left unprotected without any housing or external shield, bullet CCTV cameras could be subject to rough handling and tampering. Bullet or lipstick surveillance cameras are possibly targeted and blinded by a sudden flash of light or a beam of infrared laser on the lens if there is no built-in laser filter present. This entry was posted in Home Security FAQs and tagged benefits, bullet cameras, security camera shape.